SURPRISE, Ariz. -- Like many in his Vega Baja neighborhood in Puerto Rico, Royals outfielder Juan Gonzalez dreamed the big-league dream, but would settle for a clean parking lot where he and his friends could play baseball or shoot hoops into a home-made basket. He eyed the moon, but his feet stayed firmly planted on the Earth. He considered himself an ordinary kid and to a large degree still does at age 34. "I grew up in a bad neighborhood," he said. "There were a lot of drugs and a lot of alcohol, but no field to play baseball or a court to play basketball. I used to play ball in the street and sometimes we would cut down trees in an area so we could play ball. Bad, bad, bad neighborhood." But as the years passed and adolescence gave way to the teen-age years, it was evident Gonzalez not only had a knack for finding baseball diamonds in the rough -- he personified one. His towering body frame, natural talent, and the initial stages of his trademark mustache were the first clues that Gonzalez was indeed a man among boys. The Texas Rangers saw the same thing and the club signed him as a non-drafted free agent in 1986. Gonzalez made his professional debut with the organization at age 16 and went on to become the most prolific offensive player in Rangers history. He won two AL MVPs with the Rangers during the 1990s and spent 16 seasons in the organization. The outfielder wants to play at least four more seasons before he retires. "I remember Juan was a lanky and skinny kid, but you could tell he was really talented," said Rangers hitting coach Rudy Jaramillo, who first managed Gonzalez in rookie league. "He had an above-average arm with accuracy. I couldn't tell you he was going to hit with the power he has today, but you could see he had great hand-eye coordination and he was a special athlete." Being special was not a bad thing. It was just not a Juan thing. Gonzalez was more comfortable socializing with family and friends than being the rising star in the Rangers organization. His dream of becoming a Major Leaguer was becoming a reality, but he had no idea at what price. "It's a hard change when you become pro because you are under a lot of pressure and your life is completely changed quickly," Gonzalez said. "Before I could go to the corner or to a store and talk to people, but now I cannot do that without a lot of attention. It's been a very interesting journey for me in baseball, but I am grateful that baseball has allowed me to help people." Along with driving in runs, he has 429 home runs and 1,387 RBIs, Gonzalez has spent most of his career giving back to the communities of Puerto Rico. He gives thousands of dollars annually to homeless shelters and to help assist children with AIDS. He often pays the hospital bills for children in Puerto Rico and has set up an account at a pharmacy in his old neighborhood so no child's ailment will go untreated because a parent can't afford the medicine. Gonzalez has three children of his own. His daughter, Gabriela Marie, is battling chronic illness. "It's in my heart to give because when God gives you the opportunity to make a lot of money, it gives you a chance to help others," he said. "The Bible says when you have a lot you should help the poor and the people who suffer a lot. That is very important for me and that is what I try to do." Not surprisingly, in Puerto Rico, Gonzalez is a national treasure. "Juan is the most humble person I have ever met in my life and one of the most beloved baseball players ever in Puerto Rico," said Royals center fielder Carlos Beltran, who also grew up in Puerto Rico and worked out with Gonzalez this winter. "When I was young, I looked up to him. Now I have the opportunity to play side-by-side with him and learn from him as a teammate every day." In the United States, Gonzalez is a national enigma. Many remember the Gonzalez who publicly complained about the depth of fence at Comerica Park in Detroit and the season-ending injury that followed after being traded to the Tigers in 1999. In the years before the trade, he was criticized in Texas for questioning calls by the official score keeper in the press box. Add the language barrier, his reluctance to address the media at times, and Gonzalez, the best player in Texas Rangers franchise history, is arguably the most mysterious. His two injury plagued seasons with the Rangers during the 2002 and 2003 campaigns did not help his popularity and fueled questions about his durability. "People don't know who I am or know me as a person. But my heart and my conscience is clear because I know the compassion and love I have for people and life is real," Gonzalez said. "Maybe, one day, people will know what type of person I am or what type of person I was when I played the game." Orioles first baseman Rafael Palmeiro considers Gonzalez one of his closest friends and has watched him develop over the years. He said most people do not get to see the real Juan Gonzalez. "Juan is probably one of the most misunderstood players, and I think he gets a bad rap," Palmeiro said. "He's a great person, but he's not one to express a lot of emotion to the media. He doesn't let things get to him and he doesn't let people provoke him into a reaction. Most people don't like that, and they end up trying to trample him or make him look like the bad guy. Really, he is just a quiet simple guy." For his part, Gonzalez feels he, like most Latin players, is misunderstood at times. Literally, by his accent when he speaks English, but also because his culture is different. He still struggles with English at times and prefers to do interviews in Spanish. "Some people think because we don't speak English all the time that we are stupid, but that's not true," Gonzalez said. "We are hard workers and we love the game. We have big dreams that we want to come true in this life. We have our own culture, the language and different customs, but in the last few years, I think people have learned more about what it is to be a Latino baseball player." 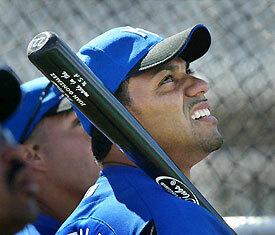 If anybody knows what it's like to be a Latino baseball player, it's Royals manager Tony Peña. Peña, who is from the Dominican Republic, spent almost two decades in the big leagues and it's his job to get the best out of Gonzalez. He doesn't see that as a challenge. After a strained relationship with Rangers management last season, Gonzalez welcomes Peña's Latino-influenced style and is reminded of his heritage everyday when he puts on his Royals workout T-shirt. The front of the T-shirt reads: "October - Juntos Podemos." On the back is the English translation: "Together we can." "We are all united together like a family in this clubhouse," Gonzalez said. "The manager is awesome and he allows us to play relaxed and there are not too many rules. We just go out there and try our best and play hard. That's our rule." The rule is extraordinary yet ordinary. A good fit for Gonzalez.